With a fascinating, potentially photo-finish Tanzania general election just a month away, it is politics that has dominated the national agenda – and crowded streets, stadiums and parks – for the last few months. Indeed, the defection of the popular Edward Lowassa from the ruling Chama Cha Mapinduzi (Independence Party) to enemy lines of the CHADEMA Party has seen considerable momentum swing to the opposition. But politics, like everything in life, comes out second best when faced-off against football. That will surely be the case on Saturday afternoon when Lowassamania will give way and Nigeria lock horns with Tanzania at the National Stadium in Dar es Salaam. The nation will switch their attention to a home team that has displayed promise and callowness in equal measure. The results tell the whole story. Swashbuckling home performances against higher tier opposition such as Ivory Coast and Morocco at home have been negated by an inability to impose themselves to any threatening extent when playing away from home against the same opposition. This is a trend that continued under the unfulfilling term of Mart Nooij as reflected by a 3-0 opening matchday defeat to Egypt. Although Nooij boasts world class pedigree, and possesses serious Hipster Points, through managing a Burkina Faso side that included Aristide Bance and Saidou Panandetiguiri at the 2003 U-20 World Cup, the Dutchman was unable to give the Taifa Stars the game management and intrepid ingredient they have been lacking on foreign soil. In the end, he was visibly given his marching orders, escorted from the pitch by a handful of soldiers as his sacking was all but confirmed after 3-0 home defeat to Uganda in the first leg of the African Nations Championship qualifiers in June. It is on that note that Tanzania march into this game under the guidance of interim coach Boniface Mkwasa. Tanzania’s pre-match preparation camp in Turkey has not been so delightful with a 2-1 defeat to Libya. Despite the undesirable result, captain Nadir Haroub, nicknamed ‘Cannavaro’ for his no nonsense defending, has spoken of a buoyant, reinvigorated mood in the camp. That mood in the Tanzania camp has been further enhanced by the arrival of arguably Tanzania’s three most recognisable players in the form of the TP Mazembe duo of Mbwana Samatta and Thomas Ulimwengu and the South African-based Mrisho Ngassa. All three failed to make the trip to Turkey. 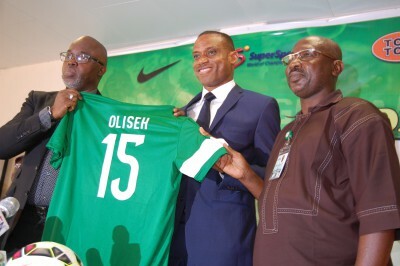 Nigeria themselves come into the match with a new man at the helm in Sunday Oliseh. The former Nigerian international has unfailingly delivered the ‘process and philosophy’ football speak which initially wins the hearts and minds of the masses, especially after the dull, rarely inharmonious football played under the watch of Stephen Keshi in his case. But it is ultimately results which wins the hearts and minds of the fans. A name-by-name interrogation of the Nigeria squad reveals a squad largely lacking in international experience and stardust. The lack of stardust isn’t such a worry as Nigeria are superior in end product and brawn, and it wouldn’t be a surprise if those attributes saw them win the game. It is the inexperience, particularly the lack of African air miles collectively accrued as a team, that is the major concern for the Super Eagles. Only five players have over 10 caps, nine others are uncapped, and the rest of the players are in a single-number of caps. It is unforeseeable that quality alone will be enough when playing against a team that has developed a habit of scathing some major names when windmilled by the fervour of their fans in their 60,000 seater stadium. Zambia, Cameroon and Morocco have all been defeated by the Taifa Stars in the last three years, while an Ivory Coast packed full of talent and the super talent of Serey Die and Jean-Jacques Gosso walked away scathed, frightened 4-2 winners. Nigeria, all things considered, would do well to escape with something. One does not really know where to put Tanzania. By administration and their fervor in Dar they deceptively appear as a CECAFA powerhouse. Instead they are weaker than even Kenya at its weakest. Even the home crowd threat is overstated because nobody remembers TZ causing waves, it is Nambole that comes close to qualification ever since Kenya lulled. Good thing though is Nigeria now is not far off the victims of Dar that you have listed. One cannot even understand what NFF is pulling with their coach appointment. A narrow win for Nigeria.